TableTop Nation seems to be a new tournament network created by Beasts Of War and Wayland Games which not only promotes their own brands, but also includes manufacturers and local gaming stores. And that's the interesting part, because little gaming shops and hobby stores could get involved, expand their area of outreach and national awareness. The best way to do this would be to get a reputation for running really good tournaments for particular games and offering those little extras that other tournaments tend to lack -like good food! 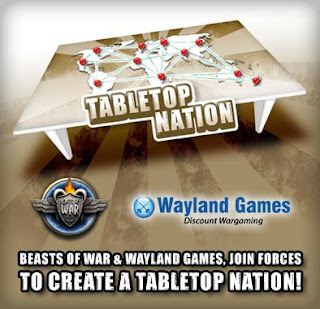 Will there be other features on TableTop Nation like a store finder for particular games, ratings for each store and a tournaments calendar? Who knows! But I'm sure that the wargaming community can ask for these functions. As I'm planning to run my first tournament in 2012 with a twist, I'm very much looking forward to what this new network has to offer. Been wondering when one of these larger online brands would step up and try this gamer networking idea out. They seemed geared for it from the get go and almost every forum has a 'Gamer-Radar'. As you say, will be interesting to see how this evolves. Also in how they treat tournament coordinators and signing gaming stores too.